...is a beautiful collection of poetry and art that focuses on the tribulations of contemporary society. 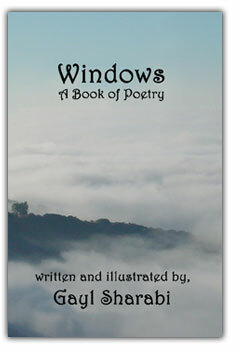 Gayl Sharabi has been writing poetry since she was 9. She is also an artist. Her work interprets the complexities of life and reveals the significance of a seemingly inconsequential moment, feeling or time period. Sharabi bases her poetry on her own experiences and was inspired to publish this book because she believes “words can move the soul.” She explains, “Color and life are interchangeable. Each painting or poem depicts a moment, and unearths a timeless cadence drawing the world into the seduction of color.” Sharabi says her family is the intrinsic reality of her inspiration. To make a purchase simply click on the 'buy now' button and follow the instructions on the secure payment site run by paypal. You can pay using an existing paypal account, if you have one, or by using a recognised credit/debit card by going to the secure checkout and clicking on the non paypal account link.